Found in FNA Volume 8. Treatment on page 398. Mentioned on page 372, 375, 397. Shrubs or trees, sometimes with swollen burl-like base (capable of resprouting after fire); bark red or reddish brown, exfoliating in flakes on young axes, retained on oldest portions of trunk and abaxial side of major limbs where forming an irregular checked pattern, or bark at first flaking on young branchlets then retained, eventually uniformly checkered over all main axes (A. arizonica). Stems erect, branching; young branchlets glandular-hairy, thinly tomentose, or both, or glabrous; new growth of rapidly elongating sprouts usually with glandular hairs; (buds ovate, apex acute, glossy red, sometimes glabrate, usually only terminal buds well developed and conspicuous; bud scales accrescent, 8–16, imbricate). Leaves bifacial or isofacial; blade ovate (widest slightly proximal to middle) or elliptic, coriaceous, margins entire or finely to coarsely toothed on sprouts and sterile shoots, plane, surfaces ± glabrous. Inflorescences clusters of racemes, 10–40-flowered. Flowers bisexual; sepals persistent, 5, connate basally, ovate to deltate; petals 5, connate nearly their entire lengths, creamy white [yellowish], corolla urceolate, (soon developing post-anthesis circumferential dimple near mid length, base inflated); stamens 10, included, (distinct); filaments slender distally, abruptly expanded proximally into swollen base, (villous proximally); anthers with 2 dorsal awns adaxially, dehiscent by subterminal, elliptic pores; ovary 5-locular; stigma capitate. Berries orange-red, red, or blackish red, ± globose or slightly turbinate, juicy, roughened-tuberculate, glabrous or thinly hairy; pyrenes 1–5, not connate into stone. Seeds 1–5, distinct, (irregularly angled). x = 13.
sw, w North America, Mexico, Central America, s, w Europe, n Africa, n Atlantic Islands (Canary Islands). Arbutus unedo is cultivated as an ornamental tree in California, where it flowers and fruits. It is reported to succeed in the USDA hardiness zones 8–10, extending along the Pacific Coast from southwestern Oregon into the region north of Los Angeles, California. It grows also in all of coastal Washington and southwestern British Columbia. Sørensen, P. D., C. E. Totten, and D. M. Piatak. 1978. 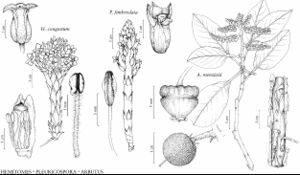 Alkane chemotaxonomy of Arbutus. Biochem. Syst. & Ecol. 6: 109–111. Sørensen, P. D. 1995. Arbutus. In: Organization for Flora Neotropica. 1968+. Flora Neotropica. 98+ nos. New York. No. 66, pp. 194–221.